View cart “Hops Pellets 100g – Northern Brewer” has been added to your cart. East Kent Golding is often thought of as the ultimate English hop. Grown exclusively in Kent, England and descended from? ?Canterbury Whitebine, it is a centuries old variety. Despite claims to the contrary, it is identical to Canterbury Golding. The two names have been used interchangeably for some time with the confusion likely stemming from its namesake. Canterbury is a town in East Kent and the hop was first brought to market there in 1790. Some, however, charge to this day that East Kent Golding and Cantebury Golding are two distinct varieties though there is no clear evidence to support this. 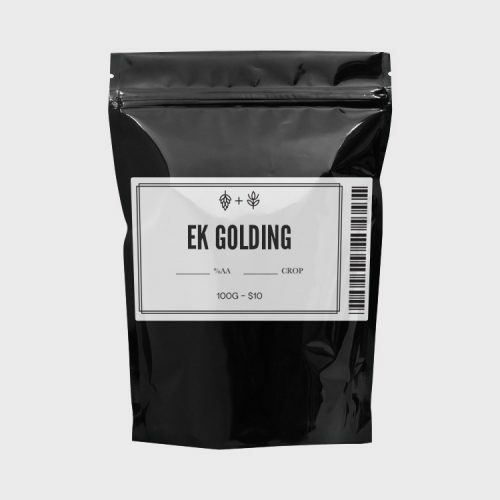 The variety began to be known exclusively as East Kent Golding in 1838. It has a good yield in England, but has shown to have an even better yield in Oregon after its introduction there in 1994. It has an amazing aroma profile with lavender, spice, honey and notes of thyme. Flavor-wise it is earthy and mildly bittering with a sweet, silky, honey-like character. East Kent Golding is considered to be the quintessential English hop, long held as one of the island? ?s favorites for ales and pale ales.